Pick up an assessment certificate for your property in the Assessor's Office. Go to the Sheriff's Office to get the bond amount. Bring the bond to a 23rd Judicial District Court Judge for approval and signature. Bring the certified copy of the bond to the jail where the person is being held. ALL FEES PAID TO THE ASCENSION CLERK OF COURT ARE NON-REFUNDABLE. Obtain a copy of the recorded bond(s) from the Clerk of Court Recording Department. Obtain the certified minutes from the Clerk of Court Criminal Department along with an Order Cancelling Bail Obligation. The fee is $15.00 per minute entry. Before the Judge signs the order. Have a Judge sign the order and bring the order back to the Clerk of Court Recording Department for recordation. If the original bond was posted form June 1, 1996, through July 31, 2017 there is no additional cancellation fee.Otherwise, the cancellation fee is $55.00. 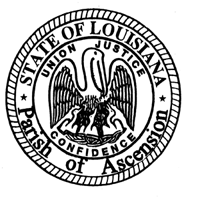 If the property used to post the bond is located outside of Ascension Parish you must follow the same steps listed above; however,bring he signed Order Cancelling Bail Obligation and the certified minutes to the Parish where the property is located.